Whether you are stranded in the wilderness or preparing for a tornado, a safe place to stay could save your life. In any disaster situation, advance preparation is always more effective than improvisation. Stock your car or basement with emergency supplies now, and learn how to seek shelter before you’re forced to. Pack a one person tent. 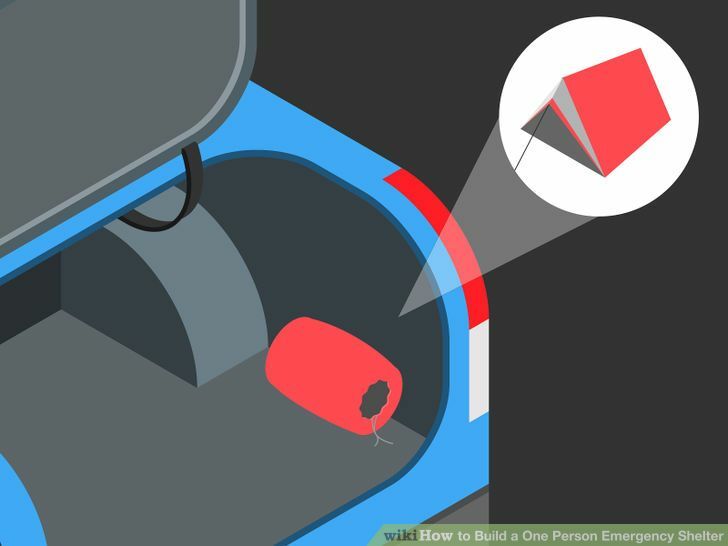 A lightweight, portable tent takes up little room in your car. Setting one up is much easier and faster than building a shelter from scratch, if you end up lost or caught in a storm. This is also a good solution if you may need to leave your home at a moment’s notice. Keep food, water, and fuel in the car as well, or in a handheld pack as portable as you can make it. Clear a patch of relatively dry ground. Insulate it with a layer of branches or dry clothing. A good rule of thumb to have 3 or more feet of debris in autumn and fall and about 1-3 feet of insulation in warmer weather and 2 feet in rainy weather. Cover this with a simple lean-to structure. If you have time and rope, lean branches against together and tie them together. If not, just lean branches, cardboard, or anything else against a tree trunk or boulder. Cover the structure with branches or other debris as well as you can for insulation (or a tarp if available). Pine branches with the needles facing down trap additional air pockets for insulation. A top layer of leaves or trash increases rain resistance. Build a snow cave. Even a bare field of snow can provide shelter if you are able to put in a few hours’ work, and the snow is packed enough to form a structure. Pile up the snow into a hillock large enough to fit you, leave it two hours to harden, then dig out a tunnel into the interior. 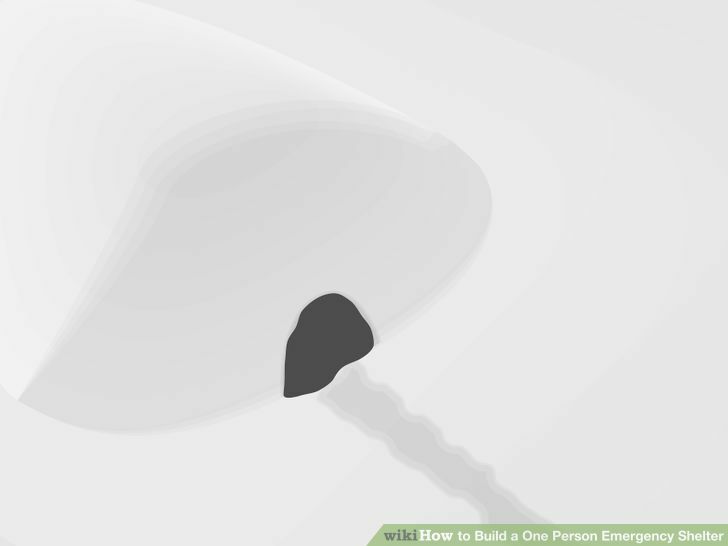 Pack a compact snow shovel to make this more feasible in emergency situations. If the snow is too powdery or if temperatures are too high (which could cause a collapse), dig a trench in the snow instead and cover it with a tarp. Keep shelters small if it’s cold. 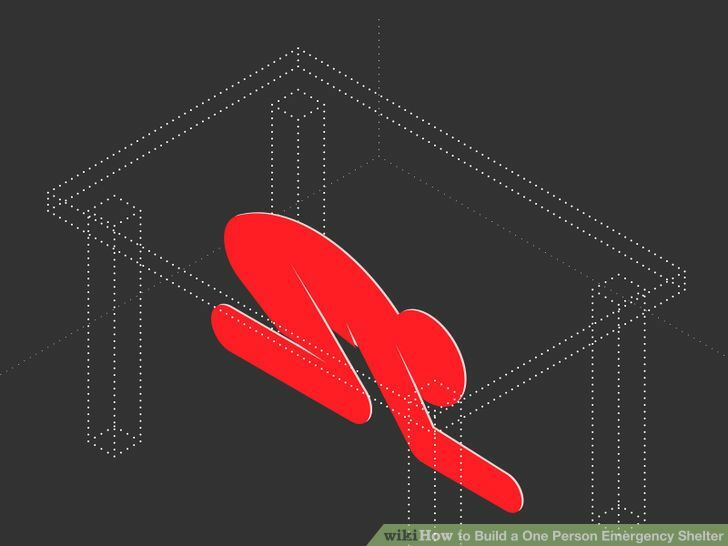 Whichever type of shelter you use, it should be just large enough to fit you. The less space there is, the faster your body heat will warm it. In warm conditions, you want a big shelter so it will keep you protected and cooler than a shelter that is inches from your face. 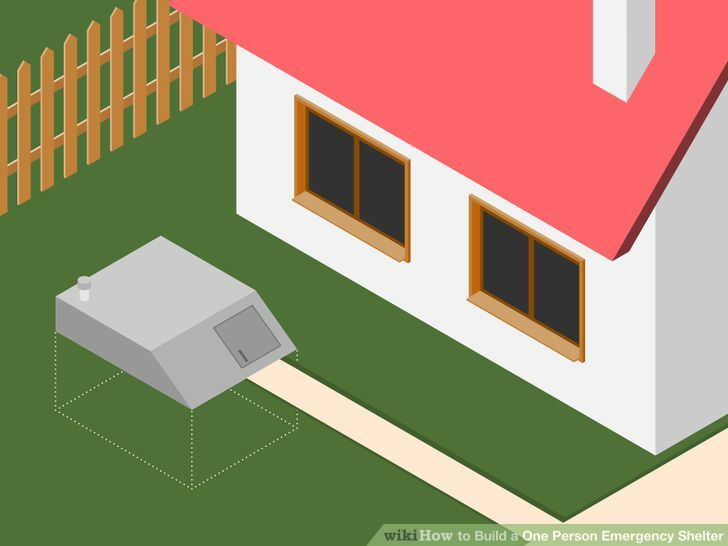 Identify hurricane or tornado shelters. 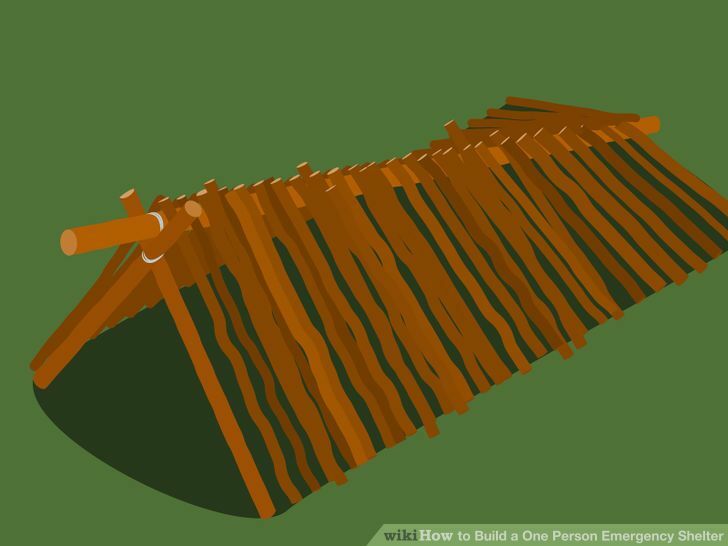 No quickly constructed shelter will help you from winds at this strength. Instead, go to a basement, or failing that to a room near the center of a building with no windows. If the tremor is mild and there is a relatively open space outside (no tall buildings), walk to it through the nearest exit. Do not use elevators. If the tremor is violent or you cannot reach an open space safely, drop under or next to sturdy furniture and hold on. 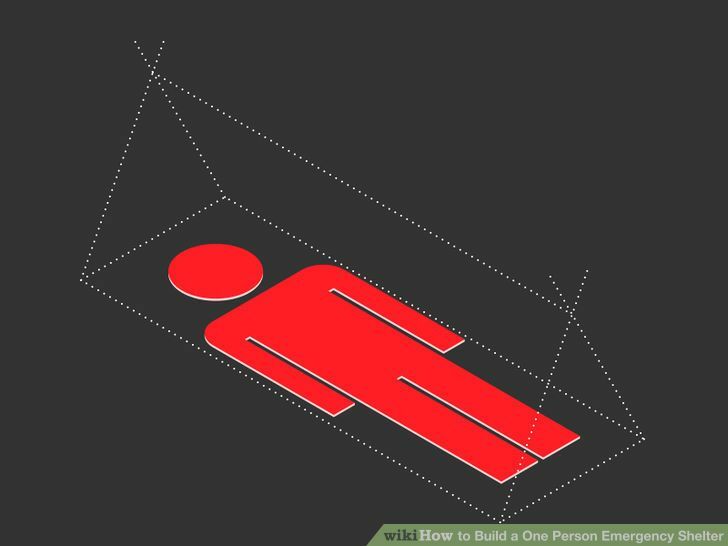 Construct a long-lasting shelter. 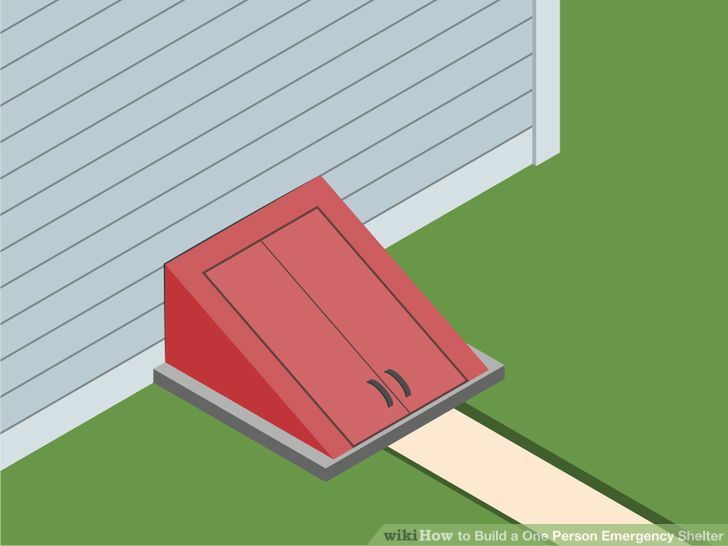 If you own a house and are committed to disaster preparation, dig out a basement or dig a bunker. Stock this with emergency supplies in case ordinary services are disrupted. You can also get a FRS or ham radio (you need a license though) for communication. 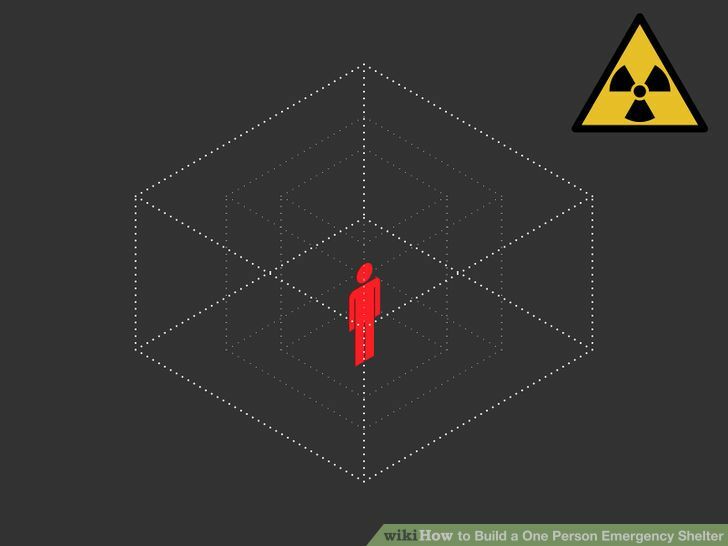 Learn how to survive nuclear fallout. An underground bunker is your best bet for protecting yourself from radioactive fallout. In general, the safest areas are indoors, with as many walls and thick furniture between you and the outdoors as possible. Insulating the walls with as much dense material as you can find will protect you further.Seal all vents using duct tape and try to close all doors. In cold weather, remove wet clothing as soon as you get inside the shelter. Staying dry is vital for preventing hypothermia. Build your shelter on high ground if you are near a creek bed or river. Don’t build a shelter too close to the ocean because tides can rise. Try not to sleep directly on the ground, lay down debris or even build your shelter on top of a compost pile, since they are warm. Even a plain rubberized tarp can be made into a tent for less of a monetary investment. Holberton School Wakes Students up to IT Operations Michael Meeks: 2016-06-16 Thursday.